Hi! I'm Hyder Khan! son of filmmaker Tahir Hussain and brother of Bollywood superstar Aamir Khan. From the beginning there was everything filmy around me due to which I got attracted to stardom and Abbu found out my interest towards the movies and he insisted me to assist in some movies where I learned a lot but later he asked me to face the camera rather than to assist which inspired me in becoming an actor. Your father and brother are very well known personalities so did this fact prove to be beneficial one in starting your career? Yeah! It was very beneficial for me as I didn't need to struggle but being related to them the expectations are high and It's me who'll have to prove, their name won't do any good to it. I think whatever background you have but when you act, you have to justify your character by the natural acting. When you are from a family which includes people like Aamir and Abbu, expectations are very high and I have accepted this fact as a challenge & it will definitely help me. 'Trumpcard' is your debut movie? No! I have 5-6 films in hand. 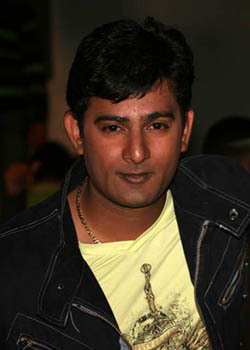 My debut movie is 'Dil To Diwana Hai' which is ready for release in January 2009. Tell us something about 'Trumpcard'. Directed by Arshad Khan, 'Trumpcard' is a suspense thriller where I'm playing the character of an angry young man who is normally a very chilled out person but gets angry on very small things. This character matches to my real life. Debutant actress Urvashi is my heroine in 'Trumpcard'. How much shooting has been completed and what is being shot today? The shooting has just started, we have completed 6 days schedule in Nainital and currently we have 4 day schedule here in Delhi & Noida. Today we have shot an item number at Elevates. You are working in 5-6 movies but still none of them is released as yet. What was the reason behind signing so many movies at a time? Which aspect do you prefer most while selecting the movie? Yeah! I have 5-6 movies in hand. Due to dates and various other reasons none of the movie is released. The scripts of all these movies were the important factor in signing all of them. For me the script and director are very important because it all depends on director how to make the things natural. What's the story of 'Trumpcard'? Tell something about working with director Arshad Khan. As I have said that this is a suspense thriller film, so I can't disclose the synopsis. Movie starts off with love & romance and suspense starts from here only. Arshad Khan is a great director, though it's just the beginning but it has been a great learning experience. He finalise the things according to his satisfaction and whatever he thinks he tries to enter the same on the screen. It took almost an hour for him to discuss the story and my role when we first met, his style of telling the story was awesome which I liked. Your elder brother Aamir Khan has created his own place, identity in Bollywood and has always created new highs. Do you have any impact of Aamir in your career? There are no comparisons when it comes to Aamir. He's a great actor and a perfectionist. It's almost two decades since his debut but still he is a learner, his passion for work is just amazing. He himself is a school for newcomers like me. There are a lot of things to learn from him, his hard work, dedication is very inspiring. I watch his movies and try to learn. If I got the opportunity I would like to work with him. Though I admire him but my father is my idol and inspiration in life. Tell us something about 'Dil To Diwana Hai'. Which are the other movies in your kitty? 'Dil To Diwana Hai' is my debut movie, where well known actress from South; Sada is opposite me and Zeenat Aman, Raj Babbar, Alok Nath & others are also playing major roles in the movie. It has been produced by Deepak Sharma and Directed by Raja Bundela. Dil To Diwana Hai explores the changing mentality of the new generation, their attitude towards family values, traditions and the requirements of a bridge that can hold them between ethics and modern culture. This apart there is a movie named 'Ghaav', will give the details on other movies according to their timing of release. I would like to finish the commitments I have taken. Also I'm looking forward for the audience reaction and will try to overcome the mistakes accordingly. Any message you would like to give to our readers? With New Year's wishes would like to request them to come to the theatre and enjoy our movies, appreciate and criticize our work so that we can provide better & ever improved entertainment to them and create our own identity. The youngest kid from Khan's family, Hyder Ali Khan is quite excited with his film and wants to create his own identity. He's happy that he is related to people like Tahir Hussain & Aamir Khan but don't want to cash the success in their name.